Bodhgaya in Bihar, where, towards the end of the 6th century B.C., the Buddha’s seated under a pīpal tree, achieved Illumination is probably the holiest of the places associated with the Buddha’s life [EAOS.3]. Over the exact spot now towers the Mahābodhi temple, but earlier shrines have stood there surrounded by the stone railings which in the early periods demarcated a sacred enceinte [see EA1983.24]. 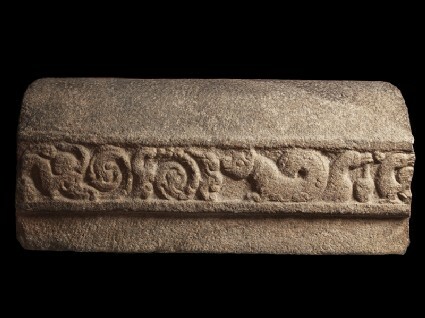 Portions of two railings remain, to the later of which the Ashmolean’s coping belonged. It was probably archaic when it was carved, its erection probably due to the presence of the older (2nd-1st century B.C.) railing already there. 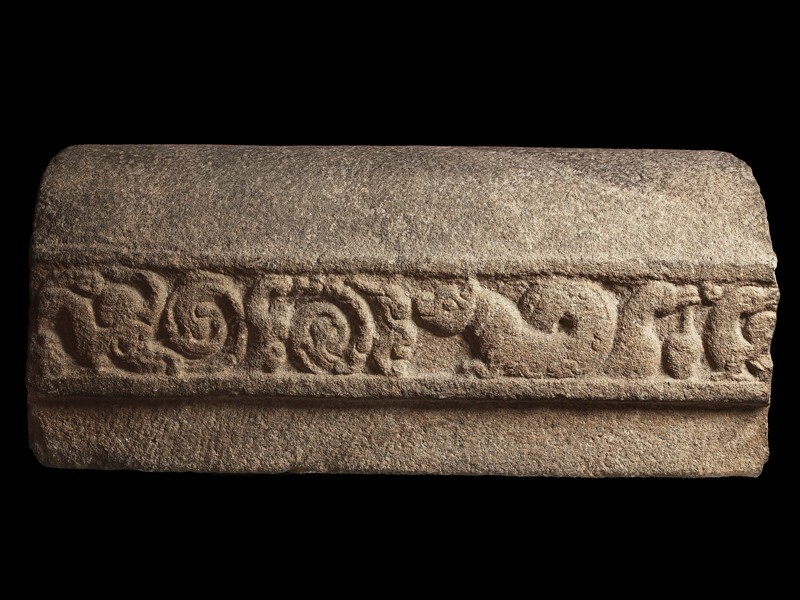 On one side runs a series of lotus or spiral roundels, separated by what may be highly conventionalised thunderbolts (vajras) on the other, a peacock, its tail, as often happens in the Gupta period, breaking out into swirls of foliage precedes a makara [see EA1971.13]. A pair of geese faces in the opposite direction. All are favourites, throughout the ages, of classical Indian myth, literature and sculpture. The style is that of the late Gupta or early post-Gupta period.